Absolutely Plastered provide the most efficient and locally recommended Top Quality Plasterers, who service the Dorset and Hampshire area. Plastering is our business and we can supply Plasterers in Bournemouth, Plasterers in Poole and Plasterers in Christchurch, in fact Plasterers covering the whole area of Dorset and Hampshire. We are proud to deliver nothing but the highest class of service for your Plastering in Bournemouth, your Plastering in Poole and your Plastering in Christchurch and no job is too small for Absolutely Plastered to undertake throughout the whole of Dorset and Hampshire. Although Absolutely Plastered are a local Plastering company covering Bournemouth, Poole and Christchurch we will travel to where all Commercial and Domestic Plastering needs to be done, the size of the work involved is no problem to us. We are more than happy to send Absolutely Plastered top class Plasterers to fill a small patch or to tackle water damaged Plaster or repair any Plaster cracks in any area of your home. Absolutely Plastered will render and plaster to a brand new finish. We can revive old plaster on walls and ceilings and plaster over artex. 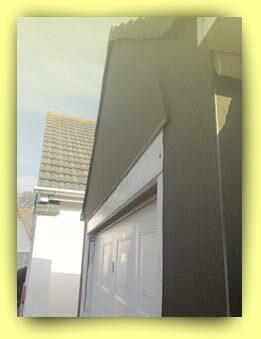 Outside we will repair old blown render and produce a top quality finish to your exterior walls. From small plastering repairs to complete re-plaster and rendering of houses... We do it all ! So whether you are Plastering your new extension, loft conversion or revamping old walls and ceilings our Plasterers in Bournemouth our Plasterers in Poole and our Plasterers in Christchurch or any area of Dorset and Hampshire will be there for all your Plastering needs. We can project manage any refurbishment of your property from the very beginning right up to the 'ready to paint' stage. Absolutely Plastered now also use K Rend, a type of silicone plaster, which incorporate silicone water repellents as an important part of the cement based render system. This allows water vapour to pass through and lets the surface underneath breath. K-Rend have an attractive range of one coat applications which is plastered directly on to the surface. The K Rend product range includes various textured finished renders, dry dash receivers, roughcast, base coats and brick effect render. The beneficial aspect is that the render is applied in the colour required, so does not need extra painting; it is water repellent, allowing the structure of the building to breath. It has long lasting qualities with low maintenance and provides a fantastic natural looking finish. For more details call David at Absolutely Plastered. If you are embarking on any major plastering projects and have any doubts about what you are about to do please call David for free advice about all aspects of plastering and rendering both inside and outside the home. Absolutely Plastered are pleased to announce that we will now be covering in and around the area of Southampton. "If your home needs plastering then be sure to get absolutely plastered with David."